Guess who's back? After another long blogging break (final year of uni + lack of motivation), I'm back with a weekend wishlist to get the creative juices flowing again. I actually have two sets of blog photos from December to post that I just haven't got around to posting. Hopefully I'll get on that this week! Topshop is the kind of brand where no matter what time of year, or what your bank balance is saying, you just can't help but add more and more items to your bag. Watching and waiting, knowing you can't afford everything you want but dreading the day an item is removed from your bag as out of stock. 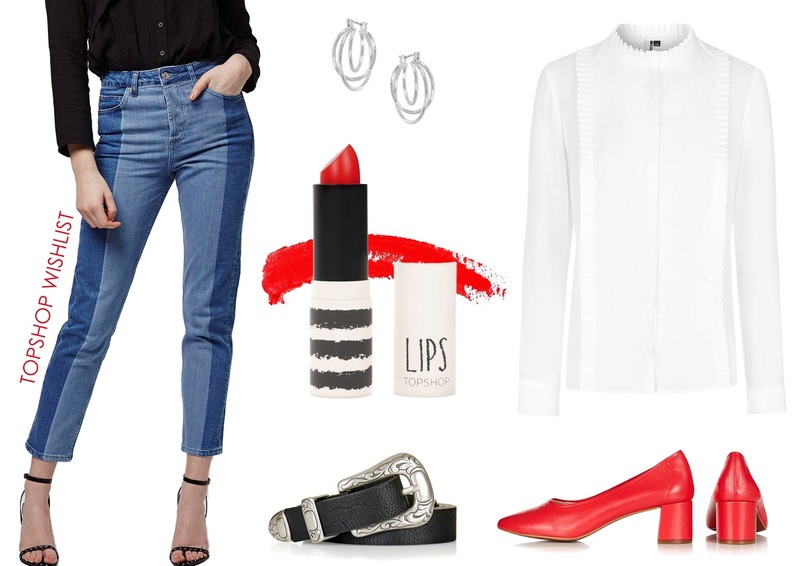 I've selected just a few of the many items I'm hoping to buy from Topshop, my favourite being the soft leather red shoes which I can't help but think would just make any outfit cooler. I'm also on the search for the perfect ruffle shirt and this clean white blouse would look perfect paired with the panel jeans and western belt. Finish with a red lipstick and some simple silver earrings and you've got Smart Casual at its best!